WARSAW, Nov 21 2013 (IPS) - Hundreds of representatives from various NGOs walked out of the negotiating rooms at the United Nations climate talks in Poland on Thursday in protest against the reluctance by developed nations to commit towards achieving a global climate treaty. 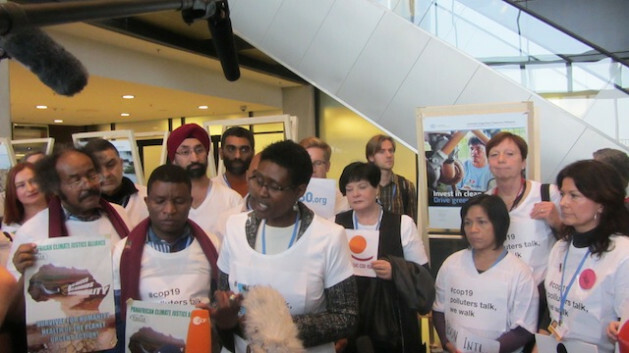 Oxfam International’s executive director Winnie Byanyima told IPS that they walked out because there was almost no progress on the key issues that they had expected the COP19 climate summit to deliver on. “This is a wakeup call to our governments, particularly the rich countries that are behaving irresponsibly by failing to take responsibility for the climate crisis. We are going out to mobilise so that they cannot ignore the voices of their citizens,” said Byanyima. She said NGOs had expected to see pronouncements by developed nations for the provision of funds for adaptation and meeting the emission reduction targets, but with the conference ending on Nov. 22, this did not appear to be a possibility. This comes a day after the G77+China group of 133 developing countries walked out of negotiations on a new international deal to combat climate change in protest against developed countries’ reluctance to commit to loss and damage. “We as civil society are ready to engage with ministers and delegations who actually come to negotiate in good faith. But at the Warsaw conference, rich country governments have come with nothing to offer,” said a statement issued by the group of organisations that led the walkout here. “Many developing country governments are also struggling and failing to stand up for the needs and rights of their people. It is clear that if countries continue acting in this way, the next two days of negotiations will not deliver the climate action the world so desperately needs,” the statement said. Mithika Mwenda, the general secretary of the Pan African Climate Justice Alliance, said if rich industrialised countries continued to block the talks, they would “hold them to account”. “We will not accept delay and we will demand our governments withdraw from an unsatisfactory outcome,” he told IPS. COP19, according to the U.N. Framework Convention on Climate Change, is mainly for planning purposes ahead of next year’s conference in Lima, Peru and the 2015 conference in France. It is not expected to have pronouncements from governments. But Byanyima said that NGOs and social movements expected Warsaw to build the momentum towards next year’s conference in Lima, Peru. She said instead of doing this, governments were going in circles on issues that have been on the table for close to five years. “It was intended to be a planning COP but we see no plans, we see no clear road map regarding emission targets, regarding resources. We are not going to get an agreement in an environment of no trust, in an environment of no plan,” said Byanyima. Hajeet Singh of ActionAid International told IPS they wanted a clear roadmap on emissions reductions by 2015. “This is not coming out. There is no money on the table, which was promised to us last year. We don’t see the loss and damage mechanism coming up and yet that is want we want to deal with disasters like what we have just experienced in Philippines. There is nothing that we are achieving here and that is why we are walking out.” On Nov. 8 super-typhoon Haiyan hit the Philippines, killing over 2,300 and affecting over 11 million people. Singh said that the NGOs and social movements had expected governments in Warsaw to agree on concrete steps to devote political energy to mobilising climate finance. He said they wanted to ensure that a clear trajectory was agreed on to scale up public finance towards 100 billion dollars per annum by 2020. Matthias Groote, the head of the European Parliament’s delegation at the Warsaw talks, said in a statement shortly after the walkout that the negotiations had reached a critical stage and called on the COP presidency to act so COP19 did not end in failure. “There is a growing sense of frustration here in Warsaw, and the concern is over how few results have been achieved so far. We need to agree on the steps towards a global climate agreement. Instead some are backtracking on their previous commitments,” said Groote. The EU has offered to increase emission reductions by 30 percent if other major emitter countries commit themselves to comparable terms. But Mwenda said the failure of industrialised nations at Warsaw to agree on an instrument for compensation for loss and damage was a betrayal to poor and least developed countries that increasingly face climate–related losses and damages. “It is a disaster for many of our countries, especially when there is empirical and scientific evidence to show that climate change-related losses are on the increase,” he said. A World Bank report released at Warsaw warned that the costs and damage from extreme weather were growing. It said while all countries are impacted, developing nations bear the brunt of mounting losses. The report said that the loss and damage from disasters have been rising over the last three decades, from an annual average of around 50 billion dollars in the 1980s to just under 200 billion dollars each year in the last decade. Brazil needs a serious talking to by ALL world governments, if they carry on thinking the Amazon is theirs for the taking then consider typhoons, floods in both the east and west a daily occurrence that will slowly wipe us out. How dare they chop down our oxygen supply, the importance and significance of the earths rainforests is that they help stabilise the global weather patterns, carbon emmissions are as important, but once you destroy forests that sponge up moisture, stop soil erosion, provide habitats for species only found in that region, displace tribes that live in harmony with nature, you have to seriously consider whether man deserves to be on this planet at all. Time to halt all felling, mining NOW. We dont have much time left.